Your administrative team—principal and superintendent—allocate time and resources for instruction. Their support is critical to developing a climate in which your arts program can grow. Administrators need your help in making the music program successful. It is the job of the music educator to provide administrators with everything they need to know to be an advocate for the program. Arts educators must therefore equip administrators with this type of information. This will allow your supervisors to speak knowledgeably about the inherent value of students participating in your arts program. Don’t assume that administrators have all the information that you possess at your fingertips. They do not. It is the responsibility of the arts educators to pass along the information received so that administrators remain up-to-date with research results and current studies. When you succeed, your principal succeeds! 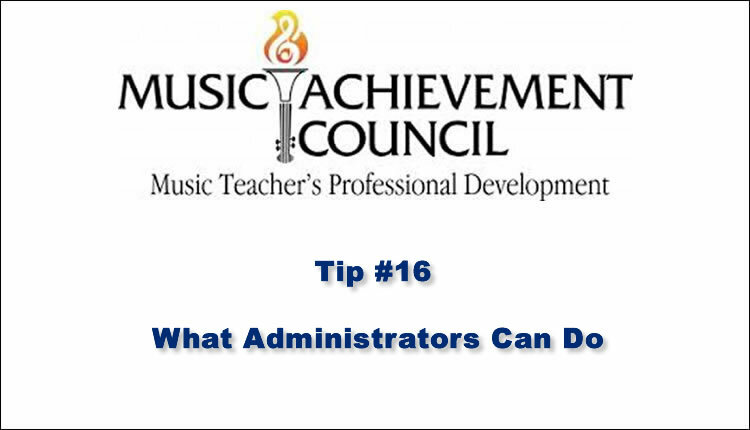 Share the following ideas with your administrative team to ensure that your music education program flourishes. – Provide music education opportunities for all students. providing entertainment for school and community events? – Provide all music classes with certified music educators. Recruit and hire competent teachers, asking current music teachers for assistance in the interview process. educators with the opportunity to work together to plan a sequential pre-K through grade 12 music curriculum. Based on the National Standards for Music Education, the curriculum will describe what students should know and be able to do at the end of grades 4, 8 and 12, as well as stating how and when that knowledge will be assessed and evaluated. It should also include teaching strategies to help students attain specified performance levels. – Ensure that student grades for music courses are weighted in the GPA—the same way as grades for other academic courses. maintenance and repair, purchase of music and current technology. teachers, coaches, parents and students must be given equal consideration. – Show your support by attending concerts. Drop by the rehearsal the next day to talk with the students. – Visit music classrooms. This is where the learning celebrated at the concert takes place. Observe the process and provide feedback to your music teachers often. – Share with your staff members the research regarding effective techniques for improving student learning. – Value your Music Education Department. They can bring notoriety to your school and build spirit among students and staff. – Read current literature. This should include the role of the arts in student achievement (for example: Eric Jensen’s Art with the Brain in Mind, ASCD, 2001). – Encourage staff to organize and plan effectively. This includes lesson plans, communication with parents and community, classroom structure and discipline management. – Be available to discuss opportunities and issues as they develop. – Encourage your music teachers to connect with teachers in other disciplines. Gaining the Arts Advantage (available at www.aep-arts. org/Publications) states that the No. 1 factor in creating support for arts education is community involvement. – Communicate to others the many music education opportunities that are available in your school. Know how these opportunities compare to those in other surrounding districts of similar size. – Invite parents and community members to visit music classrooms and observe the process of music education; always be looking for ways for your music educators to extend their programs beyond the classroom. – Know the instructional needs of your programs in terms of time, resources and the number of students served. – Make presentations or invite arts advocates to speak at PTA and community meetings (such as those of service organizations) to share the importance of music education for students. – Know and communicate the benefits of sequential curricular music education. – Become familiar with the ways participation in music education develops creativity, promotes higher-order thinking skills, enhances sensitivity and understanding of self, instills disciplined work habits and correlates with gains in standardized test scores. Collaborate with your administrative colleagues and faculty to support standards-based arts education. educational experience. Insist that arts educators support the school’s total educational vision. Provide time for educators to develop and deliver integrated learning opportunities. school newsletter, on fact sheets that can be handed out at open house evenings and at parent-teacher conferences, as well as in school activity programs and mailings. Invite arts educators to make presentations regarding the value and process of music education at administrative conferences and as part of teacher in-service days. Include articles in individual school and school district newsletters that communicate the value of arts education in a student’s education and preparation for the future. Want more tips for keeping music strong in your schools?